All the decorations were castle-themed, with the Queen's chamber, where we made a beautiful altar to the Blessed Virgin. The King's chamber was in the chapel, where the "King of kings and Lord of lords" was truly present. The theme and the war cry throughout the day was: "With Mary in front, united forever". 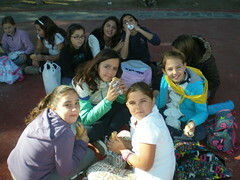 We began outside, preparing ourselves for the great surprise, and then went into the "castle" and visited all the rooms. We went to the Queen's chamber, greeting her with a bow, and then went to the chapel to greet the King. After spending a short time before the Lord we returned to the Queen's room to be with Our Lady. 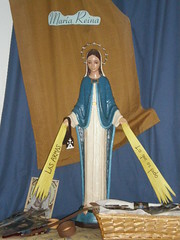 The image that we put up of the Virgin had light rays coming out of each hand. One said: "What I ask of you" and the other one: "the weapons". During the get-together we went finding out what Our Queen asked of us, which were three things: Prayer, Confession, and Mass. The weapons that Our Queen put in our hands for the fight against evil were: the Rosary, the Scapular, and the Word of God. All these things help us to have a strong soul. After seeing what Our Lady asked of us, we received a message announcing that a messenger of the King was going to come (the parish priest, Father Oscar) to be able to hear confessions. We did an examination of conscience and while those who wanted to went to confession, the rest had a time for songs in honor of the Queen of the castle. After the songs we divided into teams to make a "weapon" against the giant enemy; in other words, we made an enormous rosary. 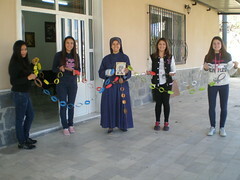 Each team was responsable of making a decade of the rosary with construction paper of different colors. On each of the beads, made by the girls, they wrote their names and decorated them. When each team finished its decade they united them forming the complete rosary and the end result was beautiful. After lunch we played some games until the bell rang, and everyone ran to the Queen's chamber to se what had happened. There they found one of the Queen's messengers crying because they had robbed the royal objects of the Queen (her crown, scepter, and sash) and there the mystery began... the girls had to guess who had robbed them, where it happened, who was the witness, and when it happened. Each team was given a folder and some cards to carry out its investigation. In the end, they solved the mystery and found the chest with the royal objects, that were returned and placed on Our Blessed Mother by two of the smallest girls. We give thanks to Our Mother and Queen for having accompanied us throughout the whole day with her presence and for what She has sown in the hearts of these girls. 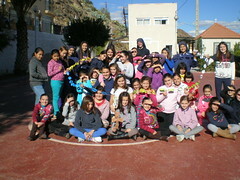 -Servant Sisters of Macael, Almería (Spain).